A new kid on the block along the row of shop houses at Tras Street, amidst the competitive stretch of restaurants, Violet Herbs opened in January 2015 is helmed by Executive Chef and owner Edward Hoe who has almost 20 years of experience under his belt. 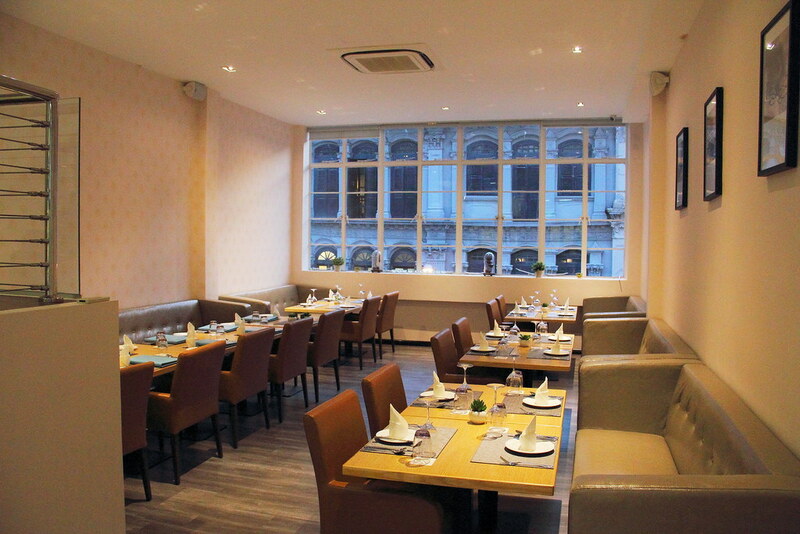 Violet Herbs offers a modern European fine dining experience at affordable prices. Dinner at Violet Herbs started with an amuse bouche of Duck Confit with Champagne Jelly giving us a glimpse of the culinary experience we are going to expect for the rest of the dinner. 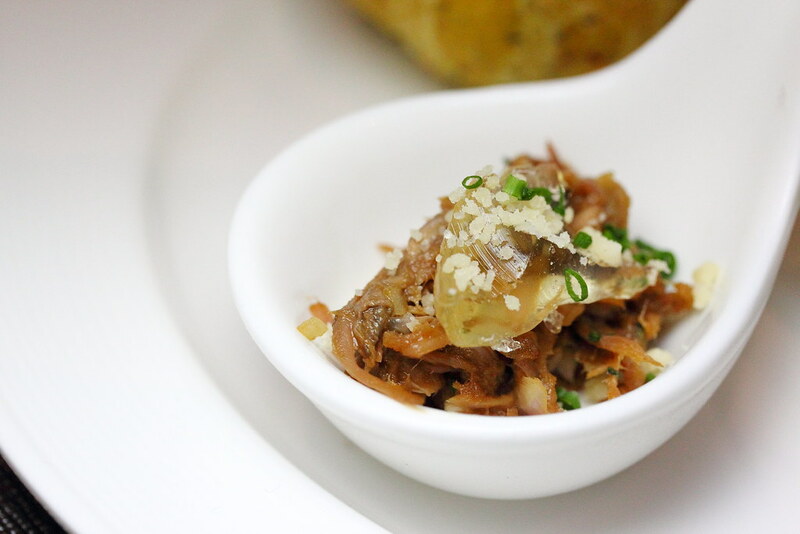 I felt the used of champagne jelly smartly blanced the dish and complemented the duck confit. Moving on to the appetiser, we have the Pistachio and Herb Crusted Scallops ($18). 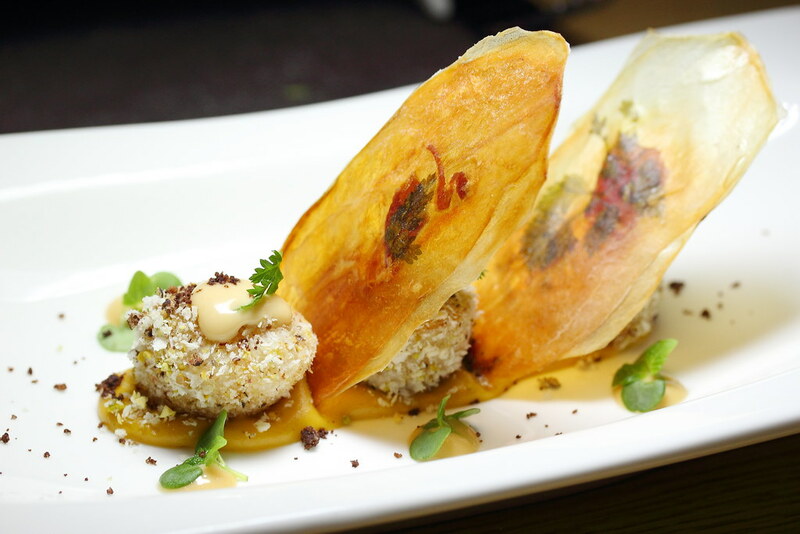 The beautiful scallop is coated with herb crust giving it a nice contrast in textures paired with butternut puree, bisque gel, potato chips and chocolate soil. An impressive delight on the plate is the paper thin potato chips which has pieces of parma ham sandwiched in between, lifting the whole dimension of a simple potato chips. 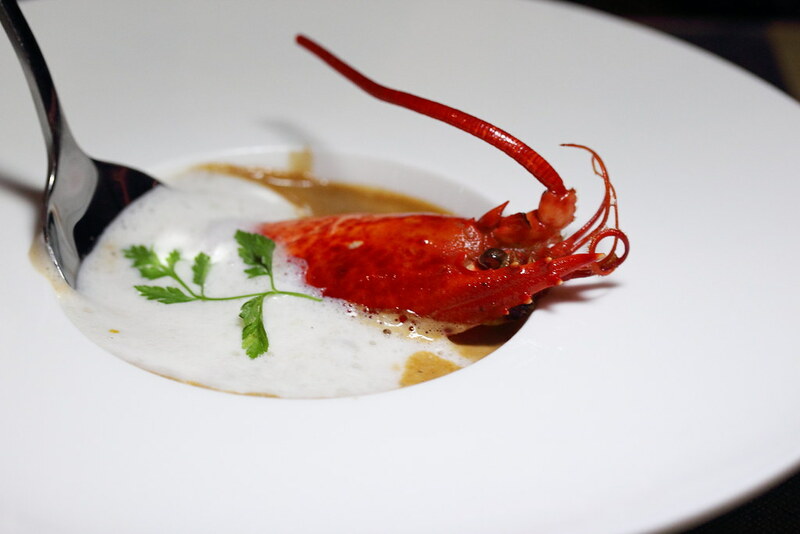 Next is a comforting and yet luscious bowl of Lobster Cappuccino and Brandy ($14) which is simmered for a good 6 hours to produce the flavouful broth. It is then further cooked in red wine and cream, finished off with a dash of cognac and topped with juniper infused milk foam. Chunks of lobster can also be found in the aromatic soup. One of the favourite mains for the night has to be Ebi Pasta ($32) which is cooked al dente and accentuated by bird's eye chilli, sakura ebi, rayu oil and lobster essence. 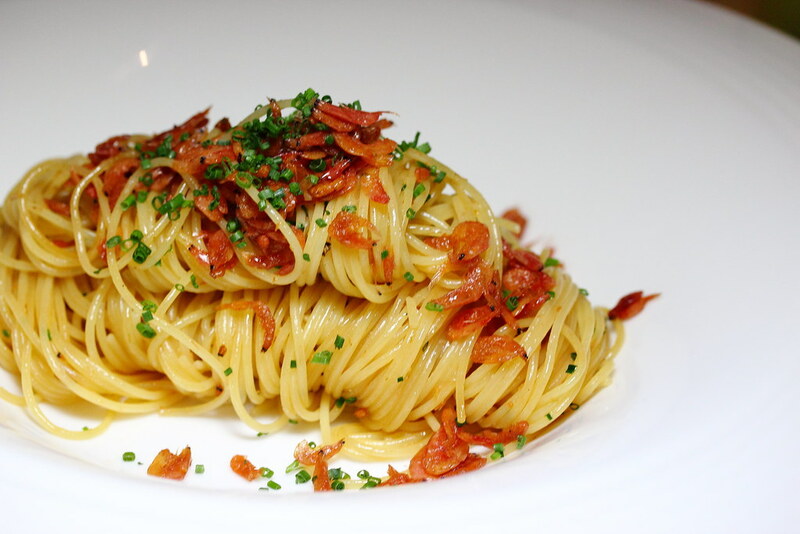 With hints of spiciness, the combination was just heavenly. The gorgeous pinkish Roasted Lamb Rump ($32) is first sous vide with olive oil, butter and rosemary to achieve the tender texture. Perfumed from the rosemary, the lamb rump is then lightly pan seared and served on a bed of creamy sweet corn with sauteed baby spinach. The beautiful meat has been cooked to a beautiful medium, tender and flavourful. 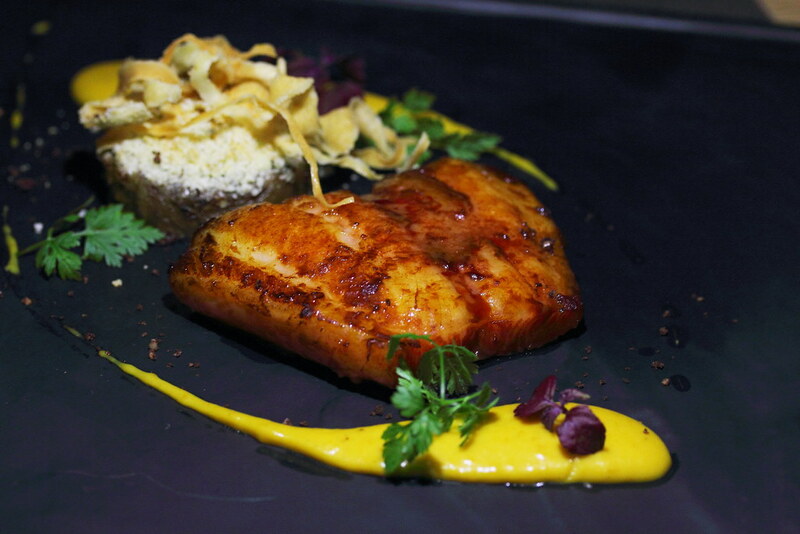 Another delectable dish on the menu is the Marinated Red Miso Cod ($33) served with roasted pimpkin, almond eggplant and mixed herbs. The red miso gave the buttery fish an added layer of sweetness lifting the flavour of the whole dish. 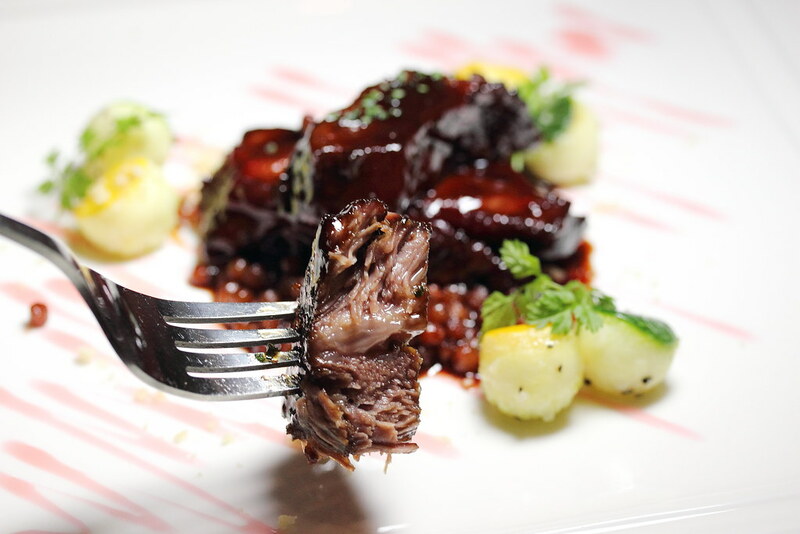 Another highlight is the Sous Vide 48 Hours Wagyu Beef Cheek ($32) that is served on a bed of chewy fregola sarda drizzled with tart raspberry vinaigrette with zucchini spheres at the side. 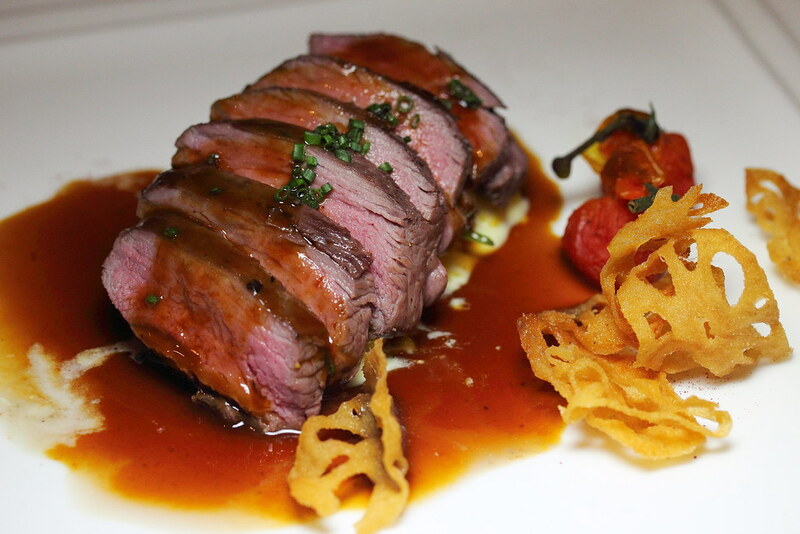 The fork tender wagyu beef is glazed with red wine and port reduction. The beef tender literally melted in the mouth with lovely flavours bursting in the mouth. 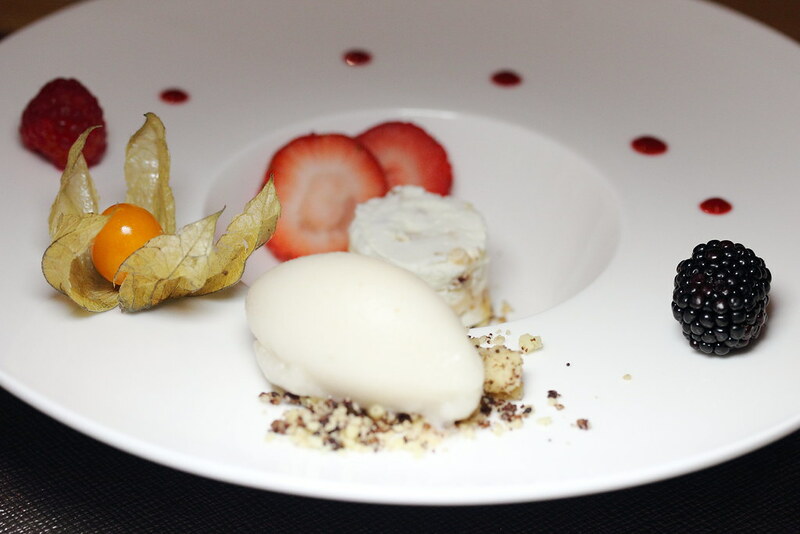 The dinner ended on a sweet note with the Frozen Nougat ($14) with mixed fruit, lychee sorbet, and raspberry sauce. I like how the tanginess of the lychee sorbet cut through the sweetness of the nougat complementing each other which works pleasantly on my palate. In celebration of SG50, Violet herbs is running a promotion on every Friday night up to end of August 2015, when customer dress in violet enjoys a 50% discount to their total bill. "In celebration of SG50, Violet herbs is running a promotion on every Friday night when customer dress in violet enjoys a 50 discount to their total bill." And do you know when the promo will run until.. ? The dishes look absolutely beautiful.. I love dishes infused with herbs! ..
My bad. it is 50% discount and it will be up to end of August.